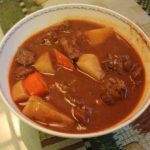 This is The Bald Chef’s recipe Irish Beef Stew Recipe. Cut into cubes 2 pounds of Corned Beef. Place the1 small can of Tomato Paste 7 0z into a bowl and flour the meat with 1/2 cup flour. In a Stock pot add 3 tablespoons Olive oil and bring to heat, add 2 tablespoons of Garlic and add the floured Corned Beef. Brown the meat for 5 minutes, and then add 2 16 oz.. cans of Genius Beer,1 package of pickling spices,1/2 tablespoons Celery seed, and 1 small can of Tomato Paste 7 0z. 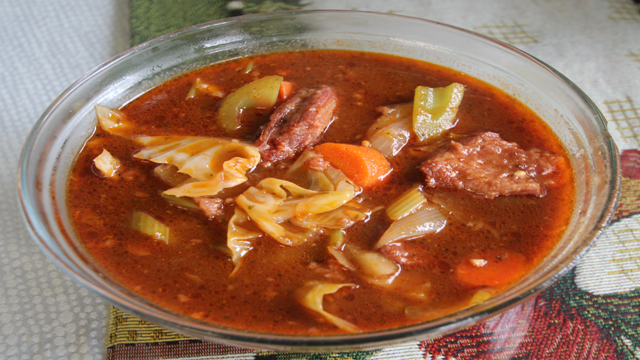 Cook this Stew for and hour and a half until the Cornded beef is tender. Cut up the 2 pealed Potatoes, and 1 Large Onion and add to the stew. Add 1 tablespoon of salt, 15 rounds of Black Pepper, and cook on medium heat for 12 minutes. Cut and add the 2 Stocks of Celery, 2 Carrots, and 1/2 Head of Cabbage. Cook the stew for five more minutes. Now your Leprechaun Stew is ready to serve. man that looks good ..
man this make regular beef stew look bland . that looks so good .awesome job thanks mate . “That is the POWER of da’ Guinness!! The Guinness must give it an excellent flavor. I always simmer my corned beef in beer. Now I’m trying your stew. That looks AWESOME! This looks amazing! I’m gonna have to get my husband to buy some Guiness so I can make this! Looks great. I like the beer idea, although I would drink a beer for every beer I pour in the pot. Cheers.